Buckle up folks – this is going to be a big post! 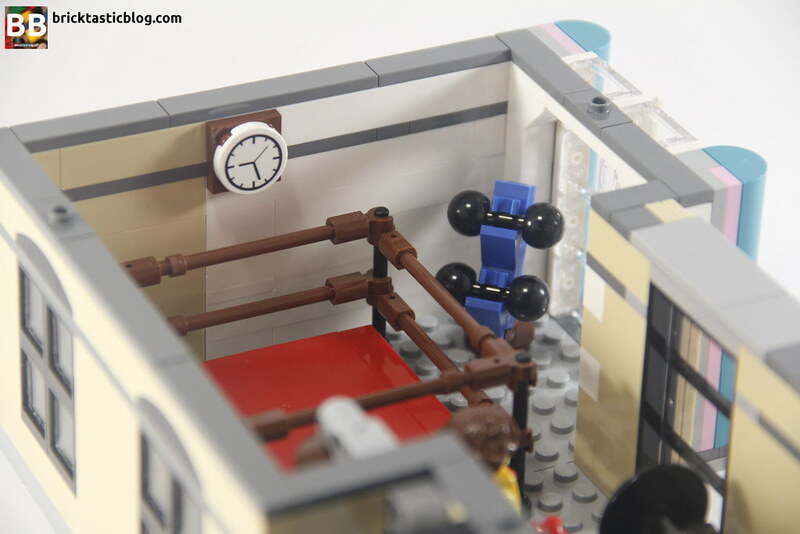 The annual Modular set release is one of those regular events in the LEGO calendar that is always highly anticipated, with an increased sense of excitement and buzz in the air. Discussions around what it will be are exciting and get a large amount of the fans involved, and the eventual official release often heralds lengthy discussions around what people think. Many of us will buy the set regardless, however others tend to be more critical. 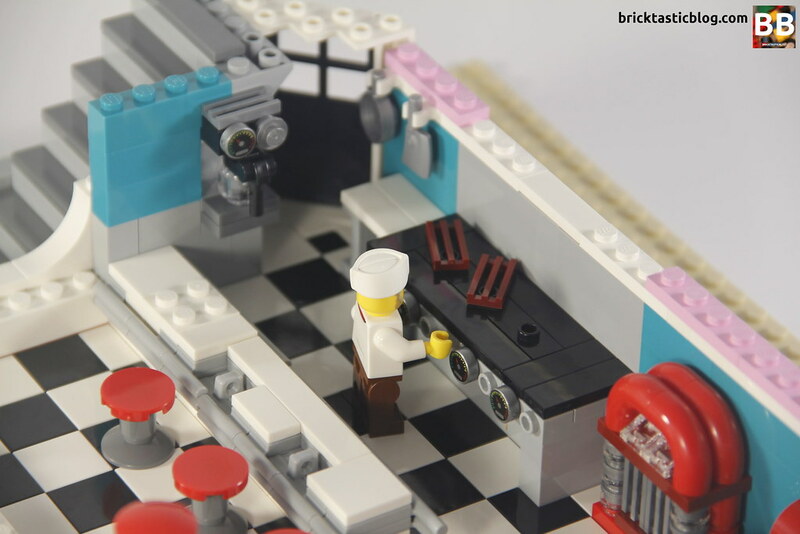 This year we’ve seen a pretty monumental change in direction with the 11th year of production of the Modular series in the Downtown Diner. 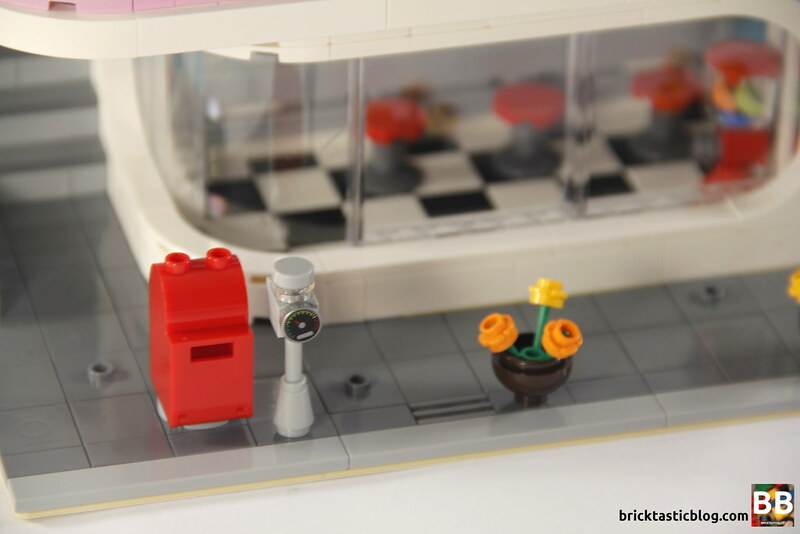 With a new decade comes a new era of modulars. 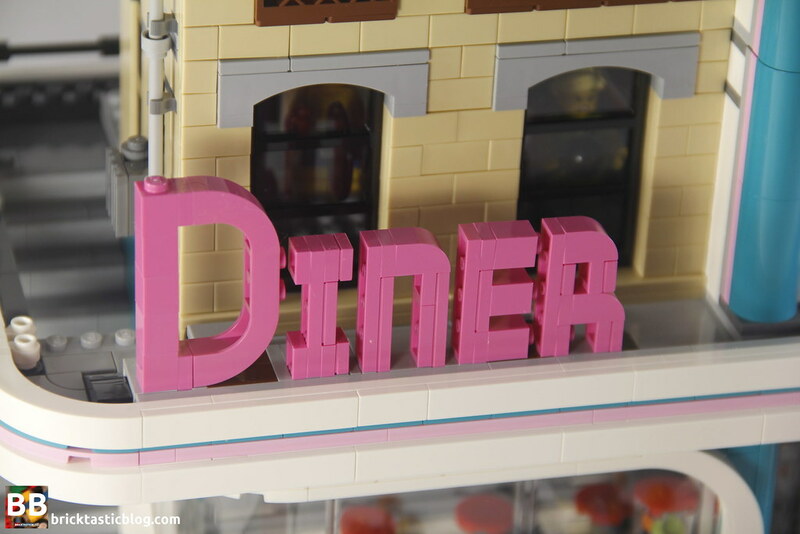 This one especially, 10260 Downtown Diner brings a vastly different architectural style, and minifigures with full face printing instead of the classic smiley face that Modulars have been known to feature. 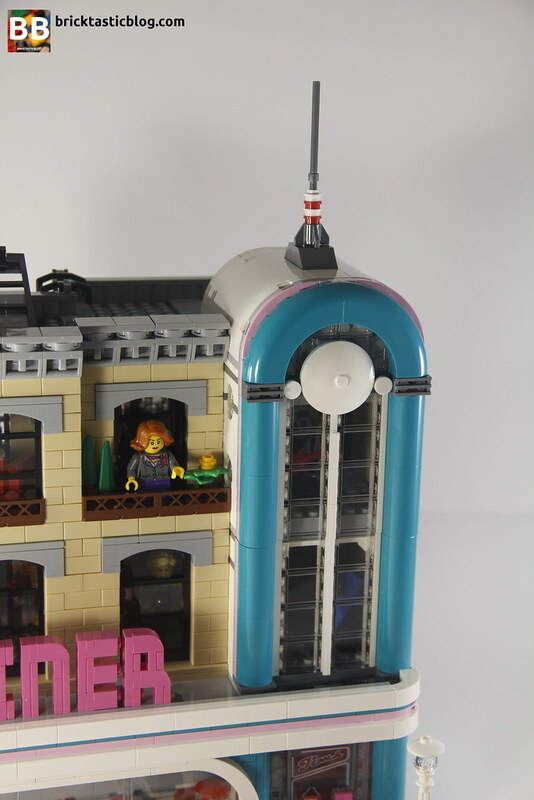 This set is incredibly unique, and not everyone was a fan of not only the full facial detailed minifigures, but the choice of an architectural style – Streamline Moderne – which may or may not have a rather jarring effect on the rest of the Modular street. 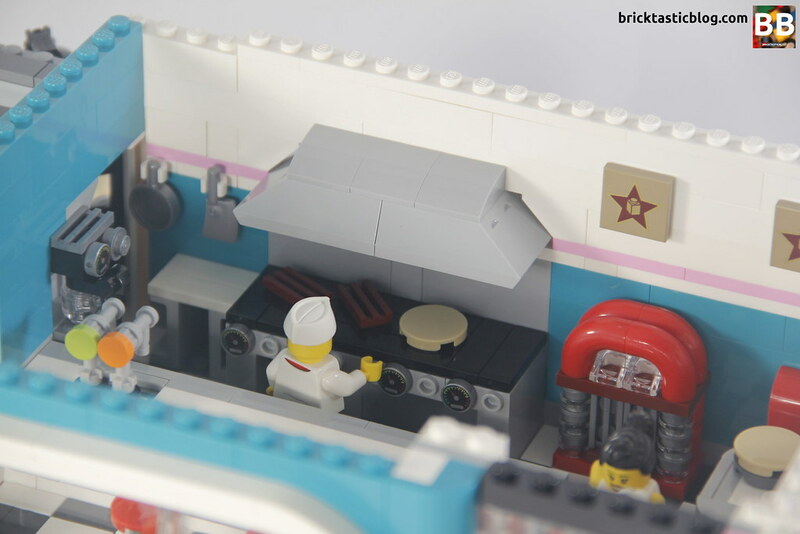 I’ll get into that later on in the review, but for now, let’s take a deeper look at the Downtown Diner. 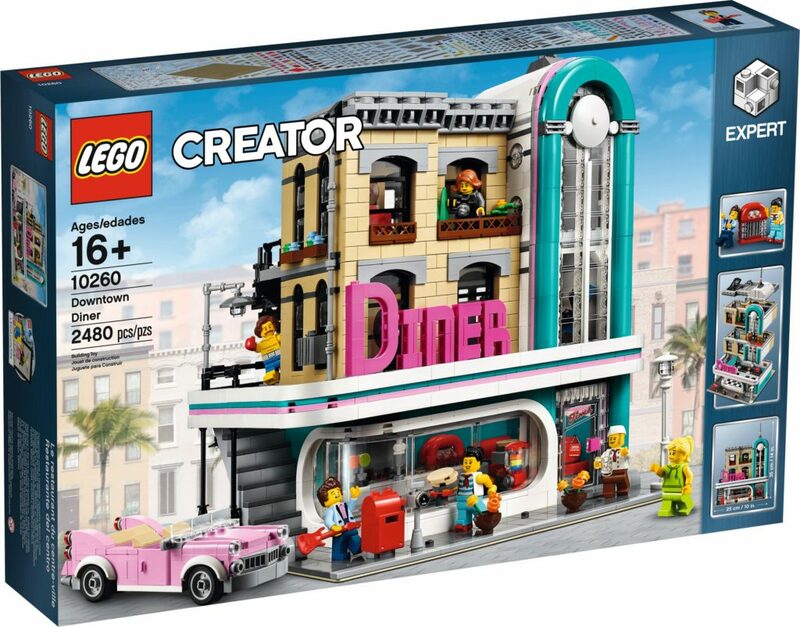 The box makes the Diner look like it came straight of Miami, with the palm trees and retro buildings, and the back showcases how the set might look in a Modular street setting. Inside the box is an instruction booklet, a 32×32 tan baseplate, four 8×16 medium stone grey plates, 20 bags split over five stages and not a sticker in sight! 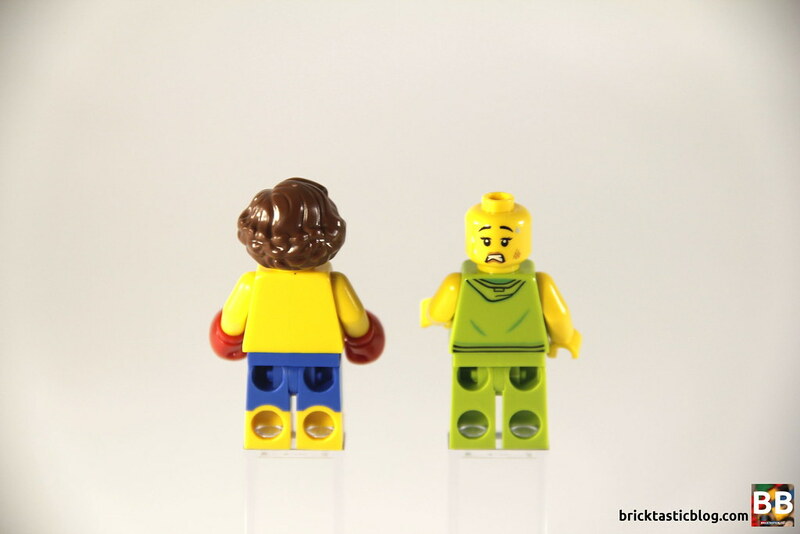 Let’s first take a look at the biggest point of contention – the minifigures. In all previous Modular buildings for the last decade, this has been one of the consistent factors. Minifigures have the classic smiley face. 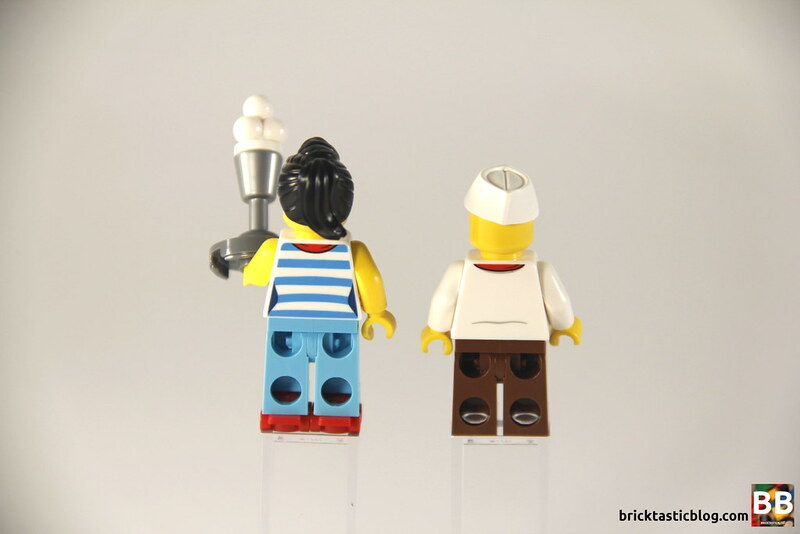 They are versatile and nostalgic and the epitome of what the minfigure is and should be. This time around, however, LEGO has decided to do things a little differently. 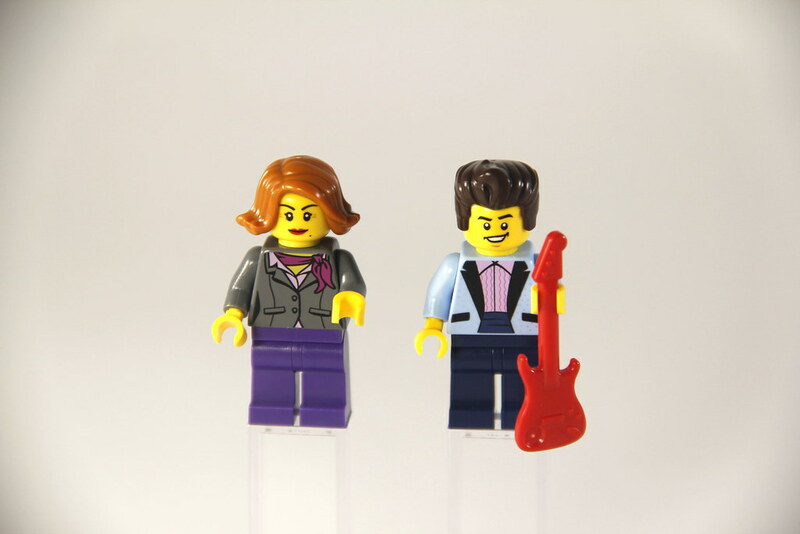 The minifigures have fully detailed faces. Many of the arguments were based on the fact that the new building’s inhabitants wouldn’t fit or flow with those of the old sets. I think that’s a little silly though. I know I’m not the only one who displays a whole lot of LEGO sets in their Modular street. The faces are not exclusively classic smiley faces. I think this is brilliant. There are so many more emotions and stories to tell with this set, now that there are different faces. Yes, the classic smiley faces were cute and iconic for the Modular buildings, but it’s a new decade, so a perfect time to try something new. Let’s take a look at those new faces now. Firstly, there’s the chef. The diner is actually called Jim’s Diner, according to the sign on the door, so I’m assuming this guy is Jim. 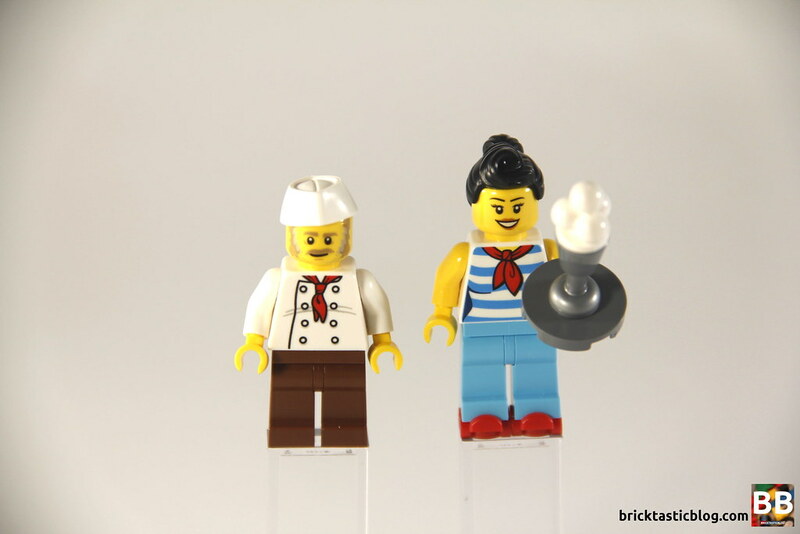 He’s got the standard chef’s whites on, which we’ve seen many times before in LEGO form, but I think Jim leads a double life. I think he’s also a keen fisherman, as his face has been seen before, in 21310 Old Fishing Store. Maybe he’s catching his fish of the day? Next is the waitress. Funnily enough, she’s got the same hair as the Diner Waitress from the Series 11 Collectible Minifigure Series, just in a new colour. She also wear some rare red skates. These were seen in a couple of Batman sets (70906 and 70922), on the feet of Harley Quinn, as well as a single one in a Speed Champions set from last year. Her top has appeared before in 60153 Fun At The Beach, a set I still haven’t picked up! Moving up to the first floor we find a female gym member. She’s wearing a rare green tracksuit, with a top that’s also been seen in 60153 Fun At The Beach. What I really like about her is that she’s got a dual sided head. She’s smiling at the start of the workout, and exhausted at the end! It’s a fun inclusion. Also hanging out at the gym is the boxer. This is one heck of a minifigure. A new torso with gloved hands, a pair of shorts that have once again been seen in 60153 Fun At The Beach, a mustachioed face and some of the most amazing hair I’ve seen on a male minifigure. 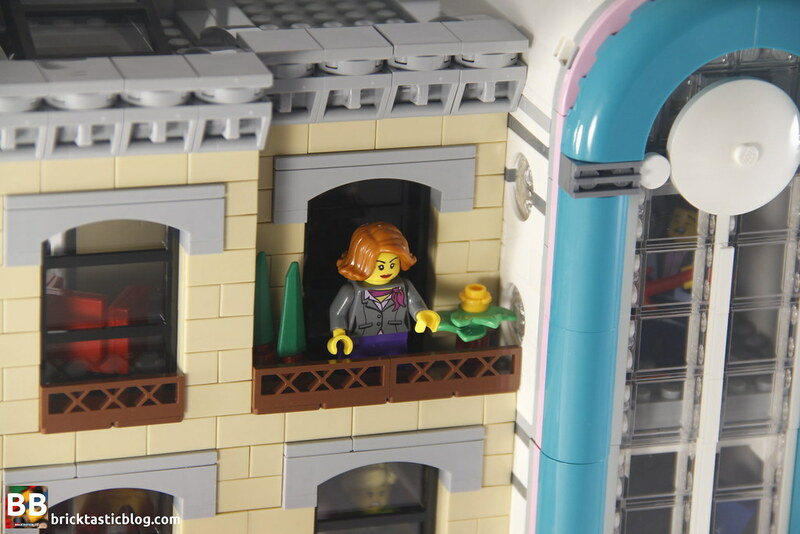 This hair isn’t new, but is very rare, having only been seen in 30165 Park Street Townhouse, on a female minifigure. What makes it more special is that 30165 is now a retired set. 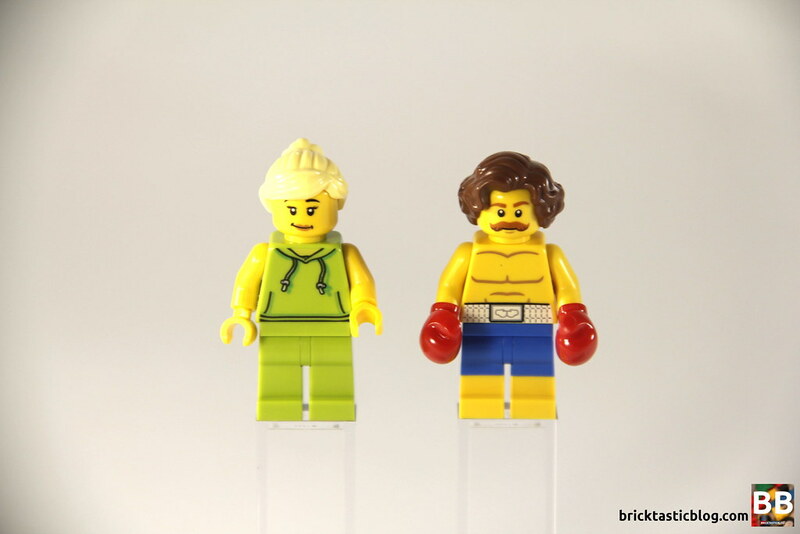 I love the longer haired look on a male minifigure, especially one that’s also a boxer. Moving up the building to the top floor is the singer. He looks suspiciously like Elvis, with some very cool hair, a new sequined jacket and another dual sided head. He’s smiling (presumably because he’s signed a record deal), and a singing face, one that will be used in many MOCs to come, I’m sure. It’s a shame his guitar isn’t printed, like it has been in a number of other sets before. Along with the singer is his manager. She’s wearing a grey suit with a purple scarf, and also has a double sided head – smiling and angry (maybe because the singer’s not doing what he’s meant to be doing). The rest of the elements are fantastic. As usual, I’ll pick up on a few more of these during the rest of the review, but there are some excellent inclusions. The brand new elements include nine different moulds in the beautiful new teal colour, four in bright pink (seen in the sign), the new printed Rock N Roll 2×2 tile, the aforementioned minifigure elements, five elements in light pink, and a new 1×2 SNOT plate in dark grey. Other parts of note include red macaroni tubes, 2×2 and 4×4 curved tiles in various colours, new flower stems that can be held in minifigure hands, a corner door frame (it’s definitely not new, but I’ve not got one), 1×3 double jumper plates, new five petal flowers and leaf elements which look stunning, 5×5 round corner bricks in teal, the four pin TECHNIC beam with ball cup, and so much more. Phew! 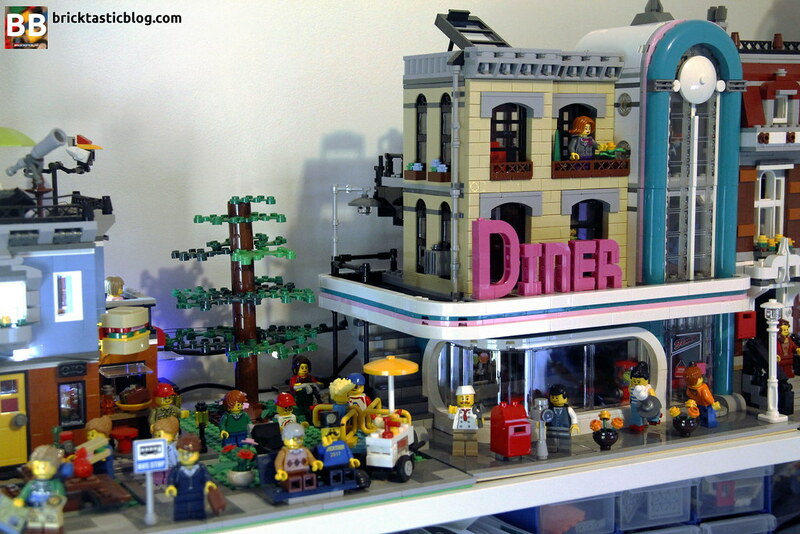 While the modular buildings have less of an inherent play drive, it’s certainly there. I had some younger LEGO mates around for a build afternoon just now, and I brought it down off the shelf to show them. They immediately grabbed a couple of minifigures and started “walking” them around the diner and up the stairs. So at a base level, it’s definitely playable! It’s great to see the new faces included to increase the play experience. I know that one’s imagination is a wonderful and powerful thing, but you’ve got to admit – the modern faces do add something to that play experience. However, there are also some issues – firstly, there’s not a lot of room in there, even for little hands. To get the minifigures positioned to where you want them, and to move them around during play means you need to also be a bit of a contortionist! I’m not sure whether it’s just my copy, but it’s also not as simple to click the floors back in place. It sometimes takes a bit of wiggling to get them just right. There’s also a bit of a lacking story here. For the Brick Bank and the Detective’s Office at least, there was a subliminal story that came with the set. For this one, there’s not, and I really feel that there could have been one. Again, I know that this is where the imagination steps in, but it could have been embellished a little, even to explain some of the inclusions. It’s a minor thing, but I’ve honestly really enjoyed that extra level of forethought. As is the case with all of the modulars so far, construction starts at the bottom, with a bucketload of tiling, and some wall edging. A substantial selection of black and white 2×2 tiles, with a smattering of red goes in to cover the ground floor of the diner. I’m really glad that LEGO decided to go with 2×2 tiles rather than 1x1s. Those pesky 1x1s always seem to get out of alignment! The black and white tiles look clean and vibrant, and the pops of colour already seen in the build had me really excited for the colours to come. Not too long after the tiling is down, the interior details start showing up. What I love about the build process for a modular is that it’s always jumping all over the place. Some walls here, followed by an interior feature there – it means that you’re never bored. The first interior feature to be added is the bar. It’s constructed with a standard studs on top base, along with some very nice detailing using plates with bars at each end (what I normally call the classic space gun element – admit it, that’s predominantly what most kids use them for). The top section comes later in the build process, using click hinges and a liberal use of SNOT work. It’s very clever. This does mean that there are no studs facing up, after the countertop is added, but it’s worth it for the look. As well as the bar going in, the booths, table and walls go up. As we work further up the walls, the rangehood goes in using a brilliant technique. Stamp elements are used to hold in the upside down buckets with jumper plates inside. The jumper plates connect to the stamp elements, holding it relatively firmly in place. To make it more secure, more plates and curved elements are used on the bottom of the buckets (now the top of the rangehood), with angled and standard 1x bricks holding it down. There’s a slight gap between the angled bricks and the rangehood, but it’s barely noticeable. During this whole process, the outside staircase is being built up step by step, while the smaller details are added in here and there. Once the inside of the diner is complete, it’s time to build the big window at the front, and the beautiful sweeping facade. 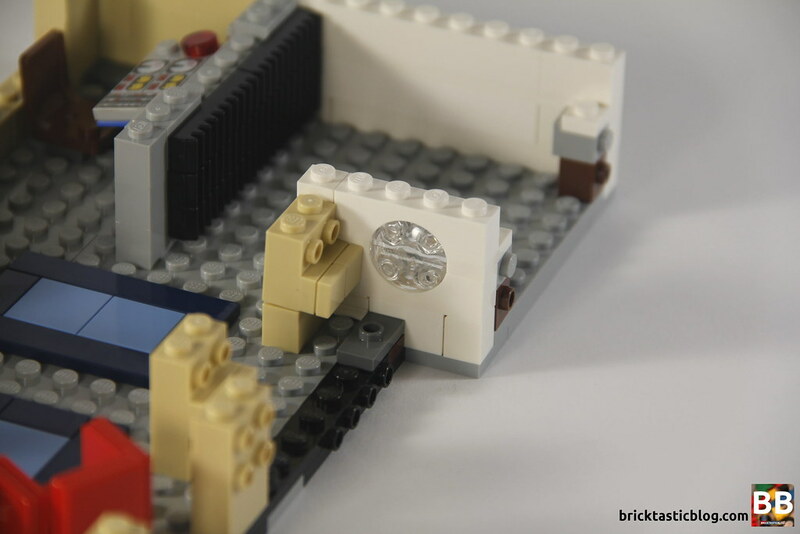 The build section for this part of the set is so clever, I don’t want to ruin the surprise for you. The stunning use of curves not only above the window, but all the way along the front of the building and around to the back has been executed in such a way that there are no visible studs. I had absolutely no idea how this was done, and when I found out what it was about, I was thoroughly impressed. It’s intricate and brilliantly pieced together. Equally so is the brick built sign – a staple in all modulars – some lettering has to be brick built, and the lettering style with this sign is gorgeous. With the ground floor done, it’s time to head up the stairs and build the first floor – the gym. There’s a distinct colour change in the walls, and like the ground floor, the gym gets fitted out at the same time the walls are built. There are some clever builds in here. My favourite is the boxing bag. The way it swings around is extremely clever and so simple. The other builds on this floor are more straight forward. The boxing ring, weights bench and rack are all quick to piece together, however the ropes around the ring are a little more fiddly. In my mind, one of the three best features about this floor (and the floor above it) is the smaller windows to the side of the building. Added upside down, the windows are inset into 1×4 arches using quarter circle 1×1 tiles, with a 1x2x1 wall element holding it in at the bottom. They are firm and look great, especially with the small recessed look visible from the side. The air-conditioner is also a nice touch! 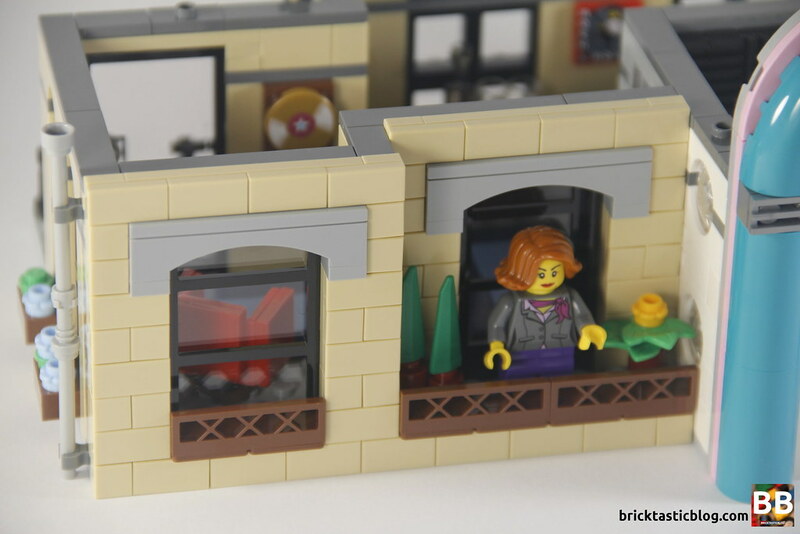 The next feature I love is the tiled panels as brickwork walls. It’s such a simple construct and yet looks absolutely beautiful. There’s visible spaces between the bricks, but not enough to see between them, and the pattern is precise. I’ll definitely be using this instead of the 1×2 profile bricks, as I can never get the pattern just right, without compromising the structural integrity of the wall, and then there’s the edge of the brick that has no detailing. The way that it’s added is just so simple and very easy to accomplish – tiles on plates! This also allows for more of a profile on the grey arches above the windows. Finally, there’s the wrought iron spiral staircase. It seems fragile when building, but when it’s added to the structure it’s rock solid and looks fantastic. The top floor with the recording studio is built next, and the front facade’s brickwork pattern joins in seamlessly to the first floor. You’d be forgiven for thinking that it didn’t split at all! The main visual difference with the front of this floor is the little balcony. The balcony showcases some new rare items, being the new five petal flowers and the new 1×1 leaf elements. These look superb on the balcony and add another pop of colour. Also next to the balcony are some domed round windows. 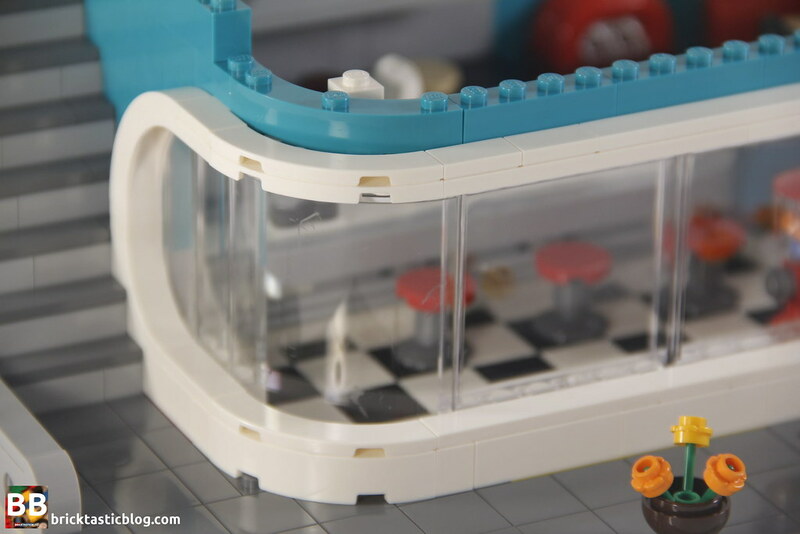 These are built with an upside down and right way up 1×4 arches, with transparent 1×2 plates and slide shoes for the glass. These fit neatly inside the dome, and while it does have a little bit of wiggle room, it’s very minor and perfectly suits the Streamline Moderne architectural style. The second floor is much more sparse inside, with the recording studio taking up the most of the interior build work. The only other building goes into a couple of rugs, a table and a chair. The recording studio is very cleverly fitted out, especially with the acoustic dampening plates on the back wall. It’s impossible to miss the large vertical arched window that runs the full height of the building. It’s akin to a jukebox, so suits the build style very well. The round detailing at the top caps off a cleverly built window that’s full of sideways studs. Finally, there’s the roof. The arched window is finished off with two sideways 4x4x6 arched wall elements, as well as a spire at the top that looks suspiciously like a radio tower – perhaps they can broadcast from the Diner too? There’s also an unseen light inside the dome. This could have been left out, but the designer added it in for completion’s sake. 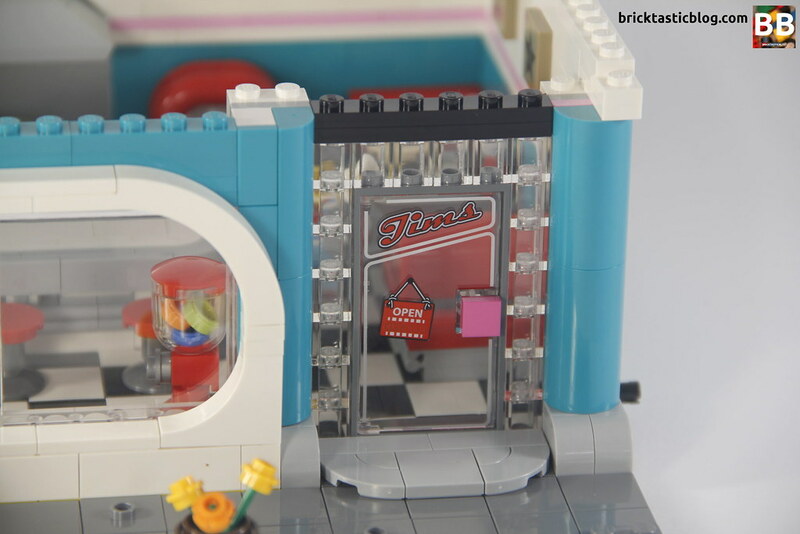 I love this attention to detail – it’s so often seen in the modular series, and is a reason why they continue to be so popular. The rest of the roof is much more simple, but it doesn’t mean it’s not detailed. There are cleverly positioned handlebars as curved ladder tops, and the decorative edging along the roof is sublime. It’s a great use of simple and easy to access parts, used in an innovative way. 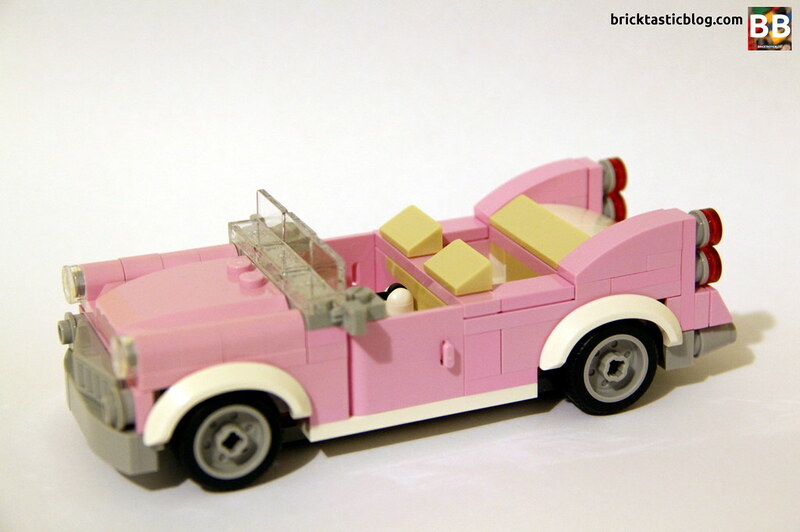 The final stage in the build for this set is the pink cadillac-esque car. 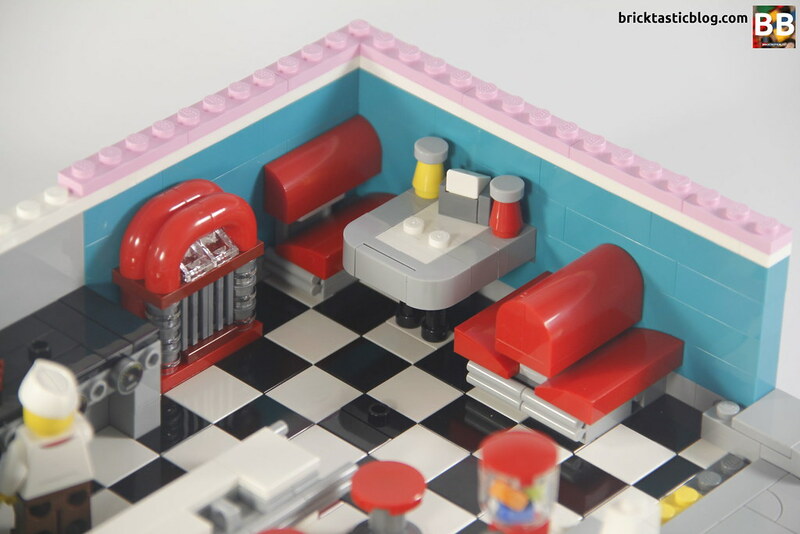 It’s a standard 6 stud wide design, with offset seating so two minifigures can fit side by side. I love the detail both in this car and out. The stacked tail lights, the headrests and even the handbrake inside shows attention to detail and clever building. I would have loved to see pink wheel arches, but the white accents work very well. This was a fantastic build experience, and I enjoyed every minute of it. It took a while (the better part of a day, but it was totally worth it. 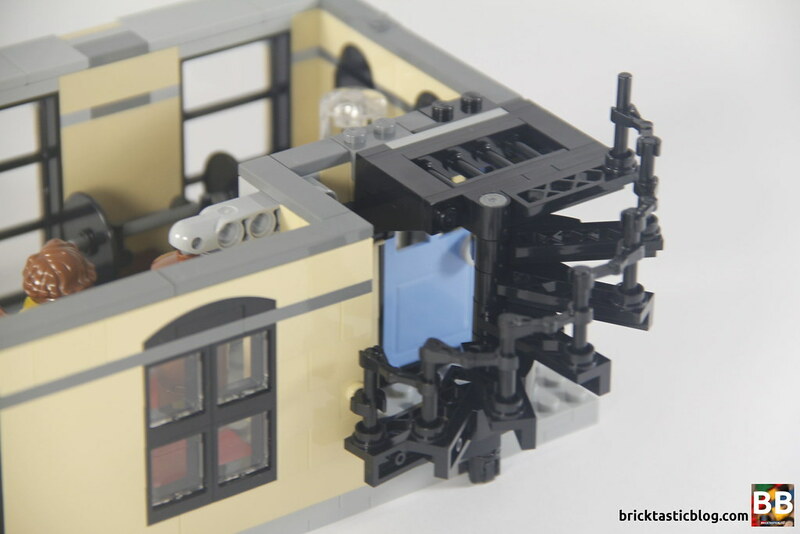 I honestly can’t think of a better and more innovative modular to build. Obviously, this set ticks a lot of boxes when it comes to this category. The bold new design certainly draws the eye and I think it has been very well executed. 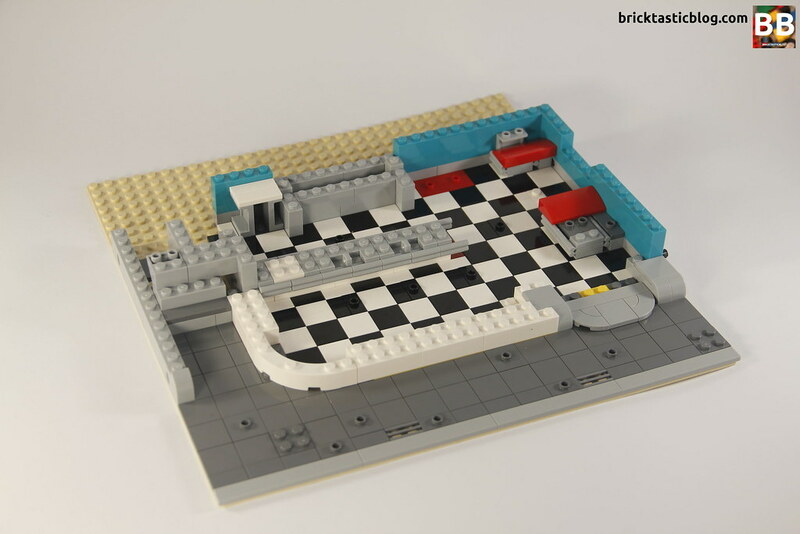 I quite like the difference between the bricked areas and the teal and curved areas. It’s almost like a boring old building has had a partial facelift. The old, original building is still visible for posterity’s sake, but there’s a snazzy new exterior. The offset of standard architectural brick and mortar style structures with the bold and vibrant lower level and towering window is marvellous. Let’s take this methodically and work our way up again. Inside the diner is a plethora of stunning visuals, including the very clever bacon and pancake cooking on the hot plate, however I’d like to focus on a few negatives this time. I’m not a fan of the loose items in this set. Yes, I can remove them (and I have – they won’t be in any of the photos), but I don’t see why there couldn’t have been a stud or two instead – take the glasses on the bar for instance. There’s no studs, when there could well have been. Sure, the bar is beautiful, but one knock of the set (especially when I’m setting it up for a photo), and they’d go flying. Likewise with the extra pancake on the table. There’s no need for it! Simply recolour an existing part and problem solved. There’s also meant to be a camera sitting loose on the front booth seat. Now, I’d forgive it if it was meant to be part of a story, but it’s not. The weights in the gym are also sitting loose. I get that these are loose though. It works, and it makes complete sense. I’m also hugely excited about finally getting a LEGO gym! 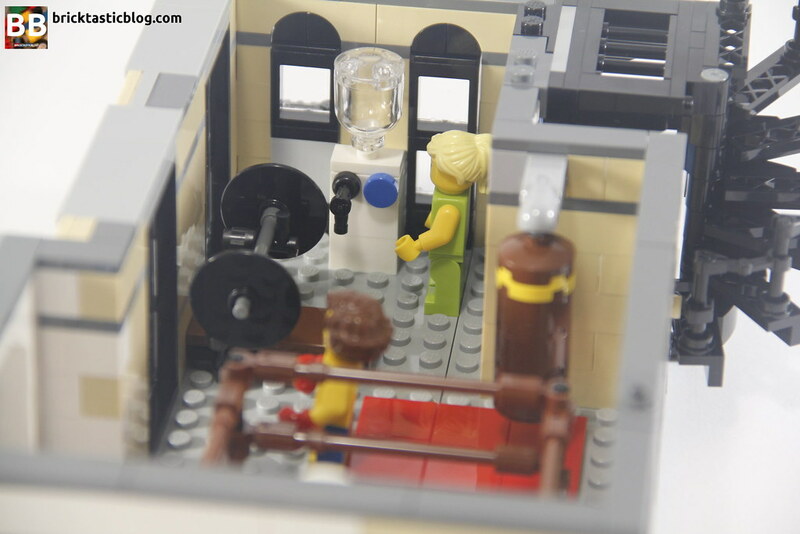 I’m a big gym fan myself, so getting such a well executed LEGO version is very exciting. The rest of the loose items though? Nope. Anyway, back to the diner. There’s a slightly larger gap between the seat and the backrest in the smaller booth at the back corner. It’s a very small detail, and I get why they’ve done it, it just needs to be one plate lower in my opinion. The drinks taps in the counter look fantastic, and I love the napkin holder and the redesigned coffee pot, as well as the little jukebox! The use of the tiles from 10232 Palace Cinema sidewalk are very clever. It’s a subtle link to the recording studio upstairs. Working our way outside, I need to mention the door. There’s double sided printing on it, and it is so subtle you’d easily miss it. Much of the printing is on the front, but there’s a CLOSED sign visible from the back, directly behind the OPEN sign. It’s such a good inclusion! There’s such an excellent use of geometry in the arches and curves of this facade. I didn’t think it was possible to close some of those gaps easily, but it’s been done flawlessly. The brick built lettering is also great, and I don’t even mind that the ‘n’ isn’t capitalised! I also like that it’s a long way offset from the actual front of the building. The space between the sign and the brick section of the structure is really unique and looks great. The back of the building, as is standard with modular buildings, is very dull. It’s always a bit of a shame to have an empty section of baseplate, but most of the time these aren’t visible in a display, and it’s very easy to change later. The back of the cooker, though, is a bit of an eyesore. I’m not sure why the wall panels were used instead of grey bricks, and while it’s unavoidable that the rear of the rangehood is poking through the wall, it’s totally worth it for the inside visual. Around the front of the building is another extension to the modular pathway. This time there is a few differences. There’s a post box and parking meter, and there are some studs on the path, which is useful for display versatility. The way the building is laid out means it could also be used as an interim corner building if need be. I’ve got mine next to a park I built, and it works really well. Ok, back to the top floor. I love the balcony. Its small, but breaks up the monotonous wall perfectly. 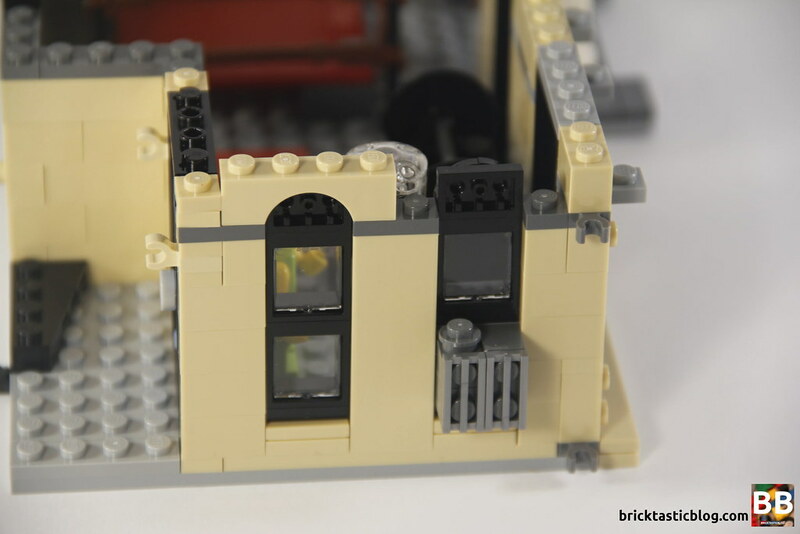 The slightly profiled arches above the windows also give the building a feeling of depth, and to the untrained LEGO eye, it seems like an impossible feat to accomplish. It would have been nice to have a desk for the manager in the top floor, and there’s certainly space for it, as well as more acoustic dampening in the sound recording studio. The large white wall to the right hand side (not sure why it’s white either) would have looked fantastic covered in the grilled plates. I realise I’m being quite nitpicky, and I know that these are all things that are relatively easy to change, however I wanted to do this set and the review justice. 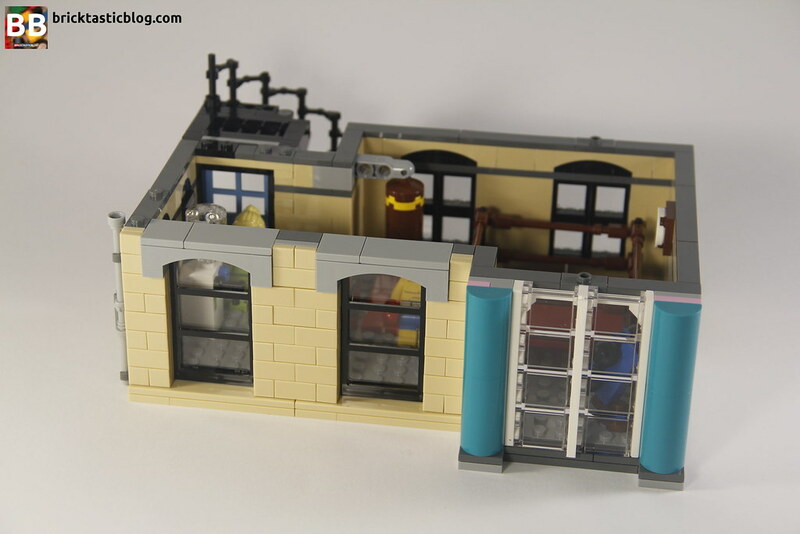 The modular buildings often set the standard for LEGO sets in terms of build, appearance and technique, and I feel there are things that need to be said, no matter how minor. 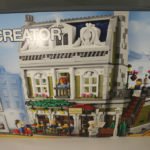 My favourite modular buildings used to be 10246 Detective’s Office and 10243 Parisian Restaurant for design – this set has overtaken it. I had mixed feelings about the style fitting in with the rest of the lineup. Sure, it’s not a perfect fit, but the brick and mortar certainly is. The rest – as I said earlier, it’s had a bit of a facelift in the early 1960s and is the exciting building that’s on the street – the unique heritage listed one. It doesn’t completely fit the overal aesthetic of the street, but it certainly gets people talking! I’d love to see more of this architectural style in the lineup. 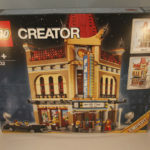 This is one of the bigger modular sets parts-wise. At just under 2500 parts, for AU $250, that is around 10c per part. At face value, already that is good value for money. Don’t forget though – it’s a modular, and comes with loads of parts in new colours (teal and pink especially), a lot of tiles and windows, and more. Modulars are also destined to rise in price. As soon as a modular set retires from sale, the price jumps up very quickly. These sets are a very good set to invest your hard earned cash in. If you were to resell them at the right time, you could make some money, and they’re great to have in a collection. It is a big outlay though. 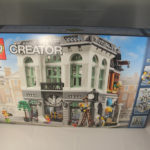 $250 is not easy for some people to spend on LEGO, especially when there’s so much choice in sets! My bet though? 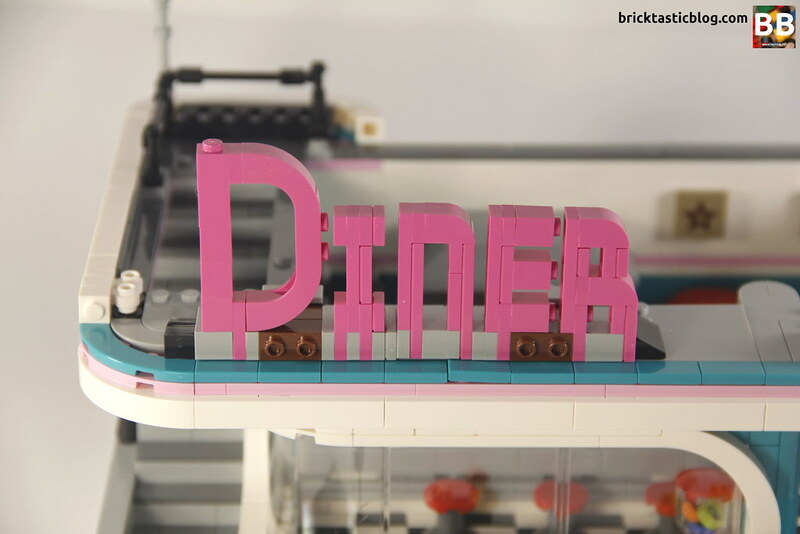 Go for the Downtown Diner. 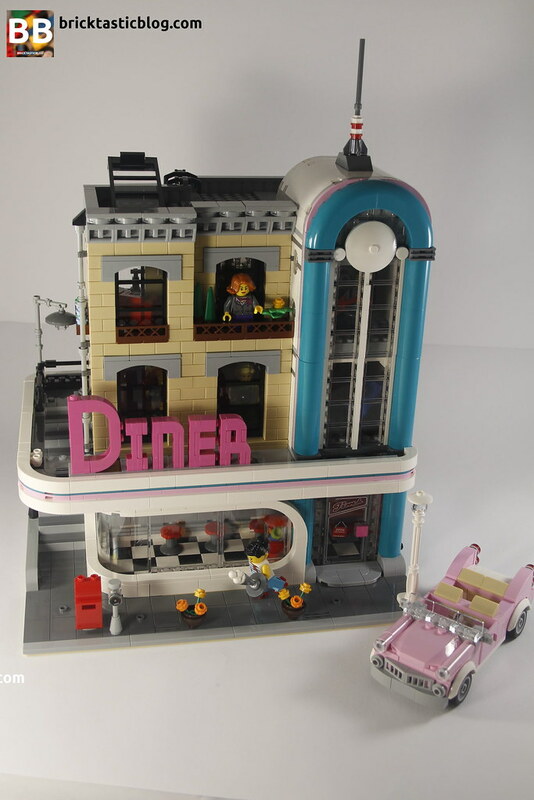 The Downtown Diner is a unique modular. 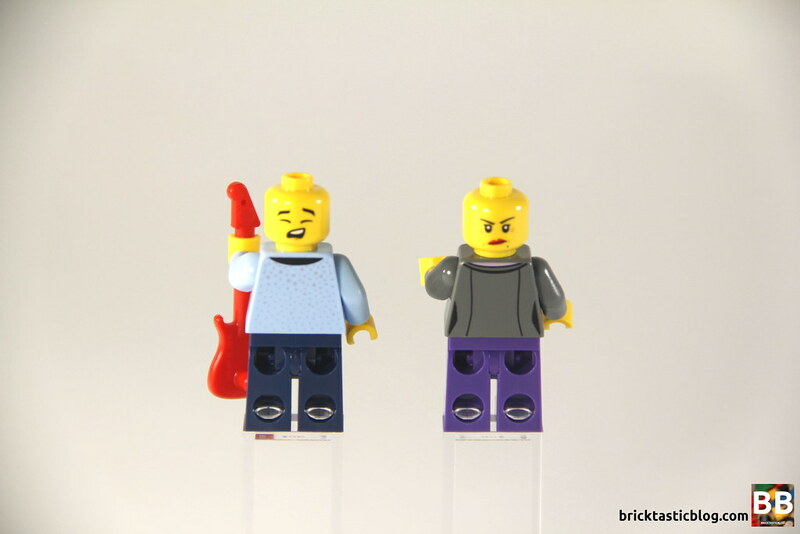 It’s a new style, with new faces, and the start of a new decade of one of the most anticipated “themes” from LEGO. 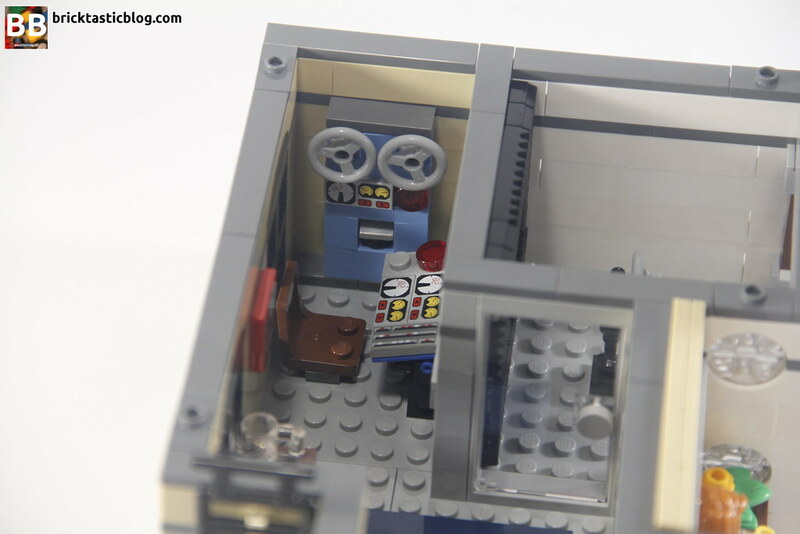 Modulars are incredibly collectible – I’d say more so than many other themes, and shows off a brilliant array of build techniques and parts. The build experience is phenomenal, regardless of some of the potential sticking points in the set itself. It may not fit with the other modular buildings, but we never know – this might be the start of something new, and you don’t want to miss that! A special thank you to LEGO for sending me a copy to review. All thoughts on this set are my own are are not influenced in any way, shape or form. The provision of sets for review does not guarantee a favourable review. Love the new direction and great review as always!